This is Miranda. She makes a mean beast of a pot roast. You should make it too. I’ve probably said it a million times, but I like EASY meals. Because let’s be real… when I’m making dinner, I have two little minions and huge doggie who thinks she’s a little minion pulling on my legs, wanting snack after snack after snack until dinner is ready and then of course they aren’t hungry… lots of screaming going on, and since hardworking Daddy doesn’t get home until 7 most nights, I need some easy amongst the chaos that always ensues around 5 p.m. This meal is easy. I probably make it almost every week. Because, not only is it easy, but it’s super tasty. And it involves bacon, so win, win, win. Get yourself a huge shoulder pot roast. I’ve started getting the biggest one I can find at the store because I know we will eat it all. 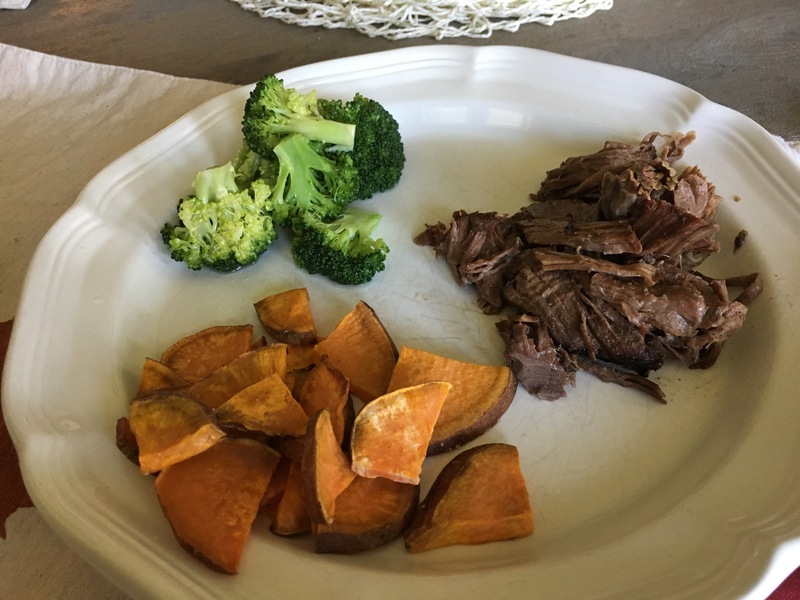 And, if I want any leftovers for myself, I need to find a beast roast because my husband always brings this to work and I can’t tell you how many days I look forward to yummy leftover roast for lunch only to find the container empty in the sink. P.S. 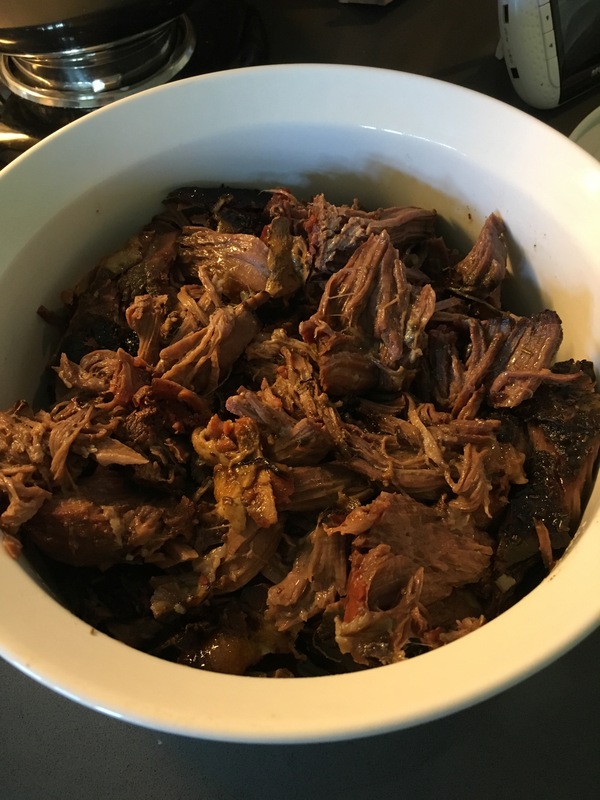 – I like shoulder roasts because they have some fat in them, and I think this helps the roast be super tender in the end. 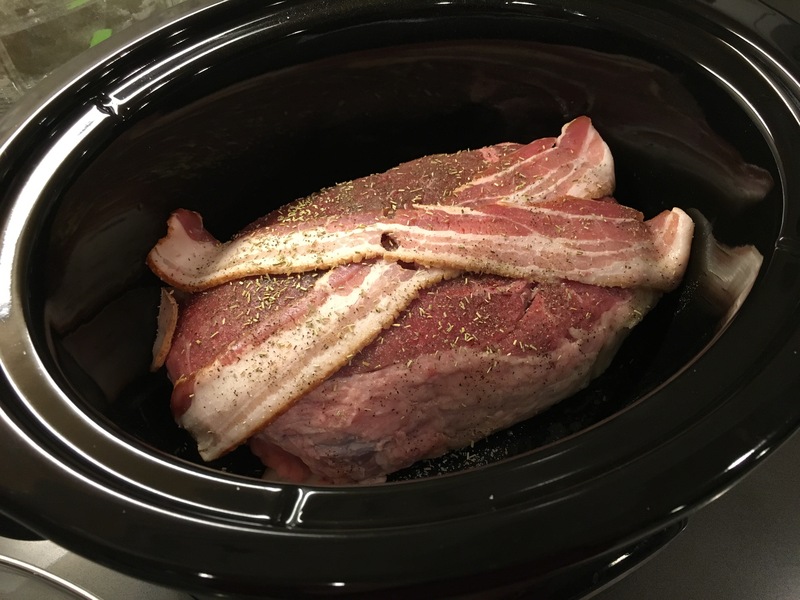 Lay a couple of strips of bacon in the bottom of your crock pot, rinse that bad boy off and lay him on top. Add one or two or five (just kidding hehe) more pieces of bacon on top. 3. Sprinkle sea salt, pepper and rosemary on top of the roast. I don’t measure this, I just cover the top, lightly but somewhat generously. 4. 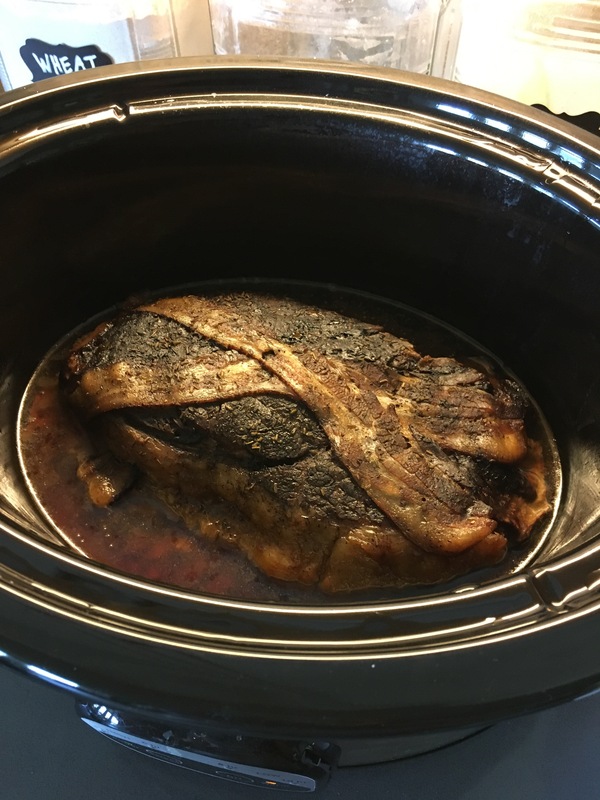 Turn on the crock pot and cook for 8 hours on low. 5. Once it is finished cooking, take the roast out and skim off fat from the sides. Shred it up and pour a little of the juice on top. Sometimes I add a little more sea salt here too.